Belvie Lam Dong bar. 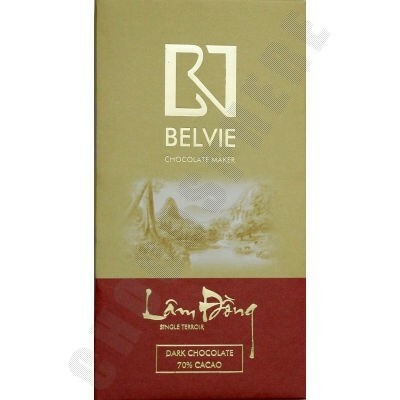 A highland region, in a mountainous province with a temperate, mild climate results in a growing area influenced by the weather making the cacao beans in Lam Dong a special type of chocolate. The taste starts with a hint of red berries and finishes with an intense chocolate flavour. Rich and very enjoyable, the flavour is dark and robust without tasting burnt. 70% cacao. Net wt 80g/2.8oz.